Fall allergies bothering you already? Unfortunately, the Midwest home to a high concentration of ragweed plants – a top fall allergen. Each plant can create up to one billion grains of ragweed pollen! Outdoors and inside, this pollen and other contaminants can trigger allergy symptoms, which make you feel miserable all season long. 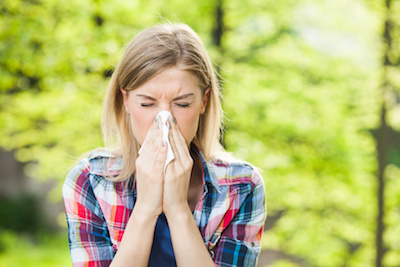 No one should have to suffer the discomfort of allergies inside their own homes, or at work where they need to focus! Luckily, we have some HVAC solutions that will help you fight against allergens, keeping ragweed and other particles out. If your current air filter is rated MERV 4 or lower, it’s not doing any good in your battle against allergies. Ragweed pollen and other airborne allergens are quite small, and require a higher-rated air filter to trap and remove them from your indoor air supply. We suggest switching to an air filter rated MERV 8 or above; our technicians can assist you in choosing the right fit for your home or business’s heating and air conditioning systems. By keeping air flowing through your home or business constantly, it is continuously moving through your high-efficiency air filter – giving the filter more opportunities to remove more contaminants. This time of year, you may not need to run your heating and cooling systems consistently, or even at all – but you should run the system fan. Set your fan to “on” instead of “auto” to keep air flowing and filtered. A ventilation system replaces stale, contaminated indoor air with fresh outdoor air – and, it filters out outdoor contaminants, such as ragweed, so you won’t be bothered by outdoor allergens. Simply opening windows and doors for natural ventilation isn’t beneficial because so many allergens are allowed inside through that process. A ventilation system keeps indoor air fresh and free from high concentrations of allergens. If someone in our household or workplace is bothered by fall ragweed and other airborne contaminants, Climate Control has a solution for you! Our NATE-certified indoor air quality technicians will offer and install HVAC solutions which will best control contaminant levels indoors, creating a comfortable and healthy indoor environment. Is Your Lexington Home A Sick Building?